Downtown filmmaker Jayce Venditti looks refreshed as he works on his laptop. He recently shaved off a thick black beard, which he grew as part of his character for his short film “Entrenched Prologue.” Sporting a baseball hat and T-shirt, he now looks more like a college senior than the veteran special ops soldier he played for the film. 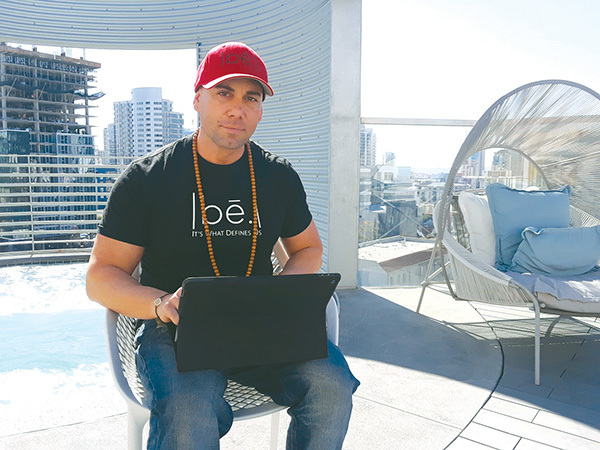 Venditti is living the California dream as he works on the rooftop sundeck of Downtown’s IDEA1 complex where he lives. His calm demeanor is a façade. 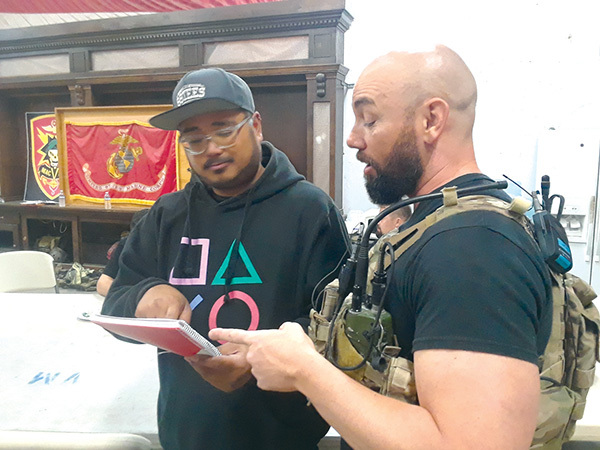 Behind the scenes, Venditti is vigorously juggling emails, phone calls and meetings in an effort to wrap up the loose ends of his upcoming movie premiere. In the film, Venditti plays senior officer Dominic Turmalino, a special operations team solder who is engaged to his best friend’s sister. 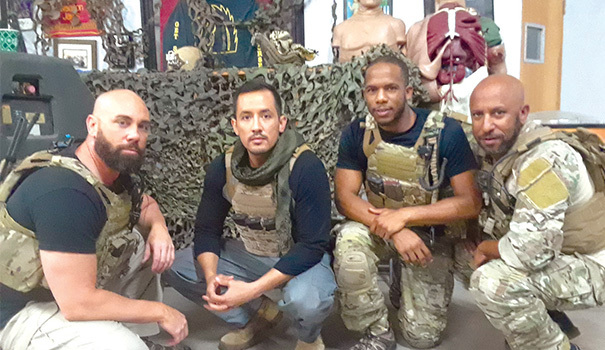 To complicate matters, his best friend is also part of the special ops team that is about to embark on a dangerous overseas mission. Turmalino and his fiancé also keep a secret from him that could jeopardize his focus on the upcoming mission. This creates tension that sets the stage for intense combat drama. “Entrenched Prologue” is the prequel for Venditti’s main feature “Entrenched,” which he plans to put into production in May. Filmmaker Jayce Venditti works atop the IDEA1 complex. With “Entrenched,” Venditti creates a new genre of film that serves to raise awareness for various nonprofits or causes. While he has an extensive background in film, “Entrenched” is the first feature that Venditti will write, co-produce and co-star in. “‘Entrenched’ is a post-traumatic stress disorder (PTSD) awareness film. Specifically, it’s a theatrical or narrative vehicle for a nonprofit called Cammies and Canines, so we’re promoting them through means of a film instead of a commercial,” Venditti said. This is part of Venditti’s own nonprofit Face the Change, whose mission statement is to promote health and longevity. “What my nonprofit has decided to do is to be a pioneer for change. A way of not necessarily creating our own programs but finding out how to supplement or create sustainable innovative ideas for other programs,” he said. 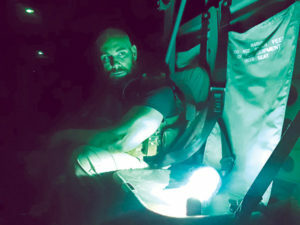 During the planning of “Entrenched,” Venditti realized the scope of his film was going to be much bigger than anticipated. In order to finish the film, he was going to have to secure additional funding. Venditti filmed the prologue at a San Diego soundstage, which doubles as a realistic combat training school. He and his crew were trained by ex-special forces soldiers in the proper handling of weapons and techniques to insure authenticity on film. Everything from the proper body language, to the correct way to hold a weapon was shown to the cast in an effort to be achieve verisimilitude. Venditti revealed that “Entrenched” begins with a scenario where the main set of characters has been killed. The prologue serves to introduce the audience to these operators before their ill-fated mission, when they are back home on vacation. Venditti is hoping that this cliffhanger will inspire sponsors to finance the second half of his feature. He has edited a trailer, which he has previewed to a select group of potential backers. “The feedback we’re getting is: ‘Wow, I want to see the combat, I want to see what happens!’ And to that I say, well, that’s why we left you hanging, help us fund that, help us finance part two,” he said. “We’re basing that concept off a movie that came out in 2004 called ‘Crash,’ which is about a bunch of different topics happening where all these different storylines converge in the end. My episodes will involve different forms of PTSD and have them come together as well,” Venditti said. “Entrenched Prologue” will premiere Downtown on April 27 with a red-carpet event and reception. This will also serve as a showcase for potential sponsors. “Were getting great feedback. We can’t wait till the premiere. We really feel that we’ll hit the ground running and get the next film financed, which is really the focus of everything, and that’s where we can raise awareness for Cammies and Canines. When we premiere this, it will be like priming the pump. This will showcase the first example of what our pilot program for A Face of Change can do for other organizations.” Venditti said. The red-carpet premiere event for ‘Entrenched Prologue’ will be held Saturday, April 27, in the IDEA1 apartment complex at 895 Park Blvd. Venditti hints that there will be some theatrical surprises thrown in as well. Tickets are available online at bit.ly/2ObbYFG.